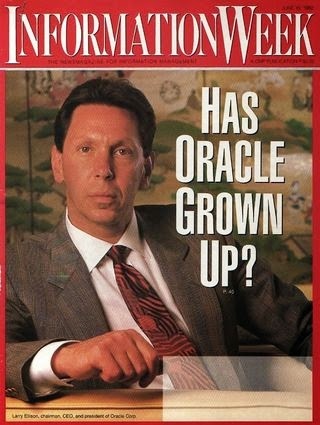 So at 70 years of age, the man who's been heading Oracle since before I was born is stepping down. So I bet he's probably going to be working in the same office, just the title under his name on the door will read "CTO". So for us at the coal face, surely this means he will spend more time directing the nature of the beast and leave operations to those who specialise. That sounds to me like a good thing. Mr. Ellison does not leave his company entirely untroubled. Besides continuing challenges in cloud computing, including acquisitions and new competition, the company faces a raft of new types of databases, first developed inside Google and Yahoo, that also threaten the dominance of the relational database. I've been thinking recently what the next generation of databases will be like. The relational model was revolutionary at the time, but bigger data and intelligent networking will surely one day reach another punctuated equilibrium. No doubt it will come from somewhere like contemporary giant Google. If I was a passionate billionare I think I would have left the business behind long ago, along with the suit.